Amazing classic studio headphones under $100. A favorite in studios around the world, Sony MDR7506 professional large diaphragm headphones are a classic choice for several very good reasons. MDR7506 offer a lot in this price range and can easy compare to more expensive headphones. Lightweight with a headband good for larger head sizes. Sony MDR7506 over-ear headphones are great for long listening sessions because they feel so light. Weighing only 8.1 ounces (229.6 grams), these foldable headphones rest gently on the head with only the slightest bit of tension on the ear pads. The headband design is great for larger head sizes because it doesn’t clamp too much. It is also perfectly adjustable for smaller heads and still feels secure. The ear cushions are adequate and not too shallow, but they are not super plush like some other premium headphones can feel. A closed-back ear cup design works well for noise isolation and to control external noise. This is great for singers and other recording artists. The closed-back ear cup design can make your ears feel a little bit warm, but you should find these headphones much lighter and easier to wear than other brands. Good overall, but the folding hinge design can feel flimsy. 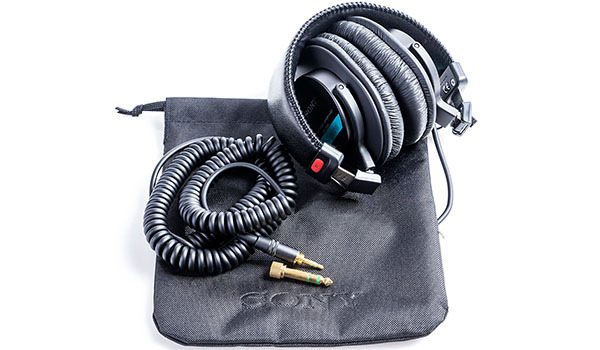 These closed-back headphones have been used in live production and critical engineering environments around the world. They will stand up to a lot of regular use. Most of the components are well built and the overall design is high quality. The only physical durability issue is that the foldable hinge design seems a bit flimsy when compared to other headphones with similar features. While this design is good for compact storage, it might not be the best for constant folding and unfolding. The wires that pass through the headband and attach to the ear cups can sometimes get pinched and break with too much flexing of the headband and hinges. Replacement ear pads are available if you ever need to fix a worn out set. Extra long cable is perfect for desk or professional use. Although the cable for the Sony MDR7506 headphones is not detachable, it is pretty long. Plus it has gold connectors. The coiled cable measures about 6 feet (1.8 meters) coiled and 9.8 feet (3 meters) stretched out. This is great for desktop use or in recording studios, but it isn’t good for all portable or mobile users. The cord material is flexible and not too thick. Some coiled cords can feel bulky and heavy, but this cable doesn’t have that problem. A soft carrying pouch and 3.5mm to 6.3mm (¼”) adapter are also included in the package. Professional quality sound that is great for critical listening. Sony MDR7506 stereo headphones are great for using in the professional studio and for critical listening. With neodymium magnets and 40mm drivers these cans produce quite a lot of sound. These headphones are considered a classic and they remain a top choice for audio engineers because of their dependable performance and neutral sound character. Sound quality and signature are still great for everyday listening to music, if that’s what you want. Bass is strong but not at all pushy or aggressive. Mids sit exactly where they need to without creating a muddy mix in the typical crossover regions. Highs may seem bright for some, but they are fairly well balanced, especially for live sound, recording, and monitoring needs. While this pair of headphones isn’t perfectly flat or audiophile-grade cans, they are perfectly suited for professional and casual listeners.